Work environments in the near future are expected to feature more autonomy, less routine, more use of ICT, reduced physical effort and increased social and intellectual tasks. Labour market skill needs will be shifting, and workers will have to supply new skills to match changing needs. An aging workforce, overqualification and job polarisation at the top and bottom of the skills scale will be some of the key challenges of the next decade; they call for action now. Over recent decades, the global distribution of labour has changed dramatically; global competition and market opportunities are likely to have continued impact on the European employment structure. Relative wages and productivity will play a key role in determining which jobs will remain and grow in Europe, and which ones will be lost to foreign competition. Manufacturing is the main sector affected by both megatrends, global trade and automation: though output will continue to grow, economic growth will be ‘jobless’ (or even accompanied by job losses). Employment growth is expected only in some high value-added sectors, such as motor vehicle production. 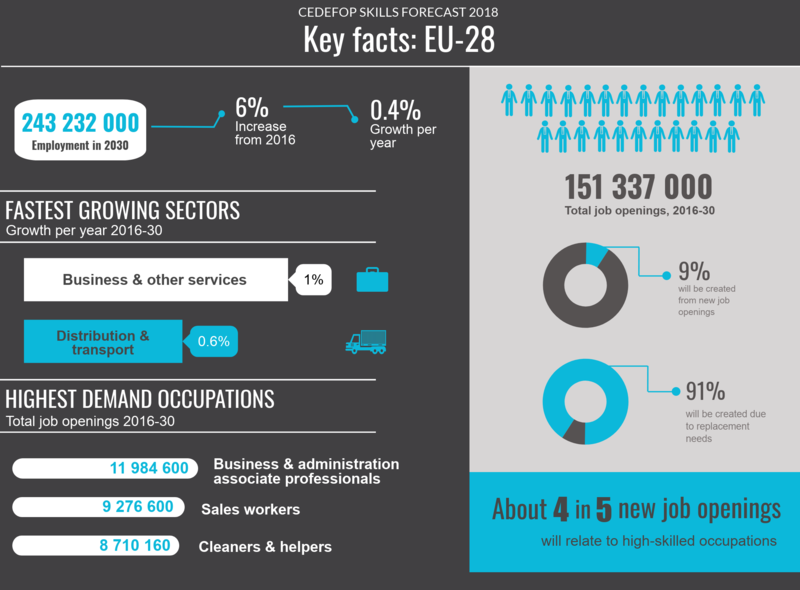 The service sector – including the platform economy – is expected to see the fastest employment growth in Europe, both in high- and low-skill occupations. Cedefop has been identifying skills mismatches and labour market imbalances across Europe for over a decade, flagging potential issues for the attention of policy-makers. A summary of the findings from the latest forecast of trends and challenges in the coming period can be found in a briefing note here.